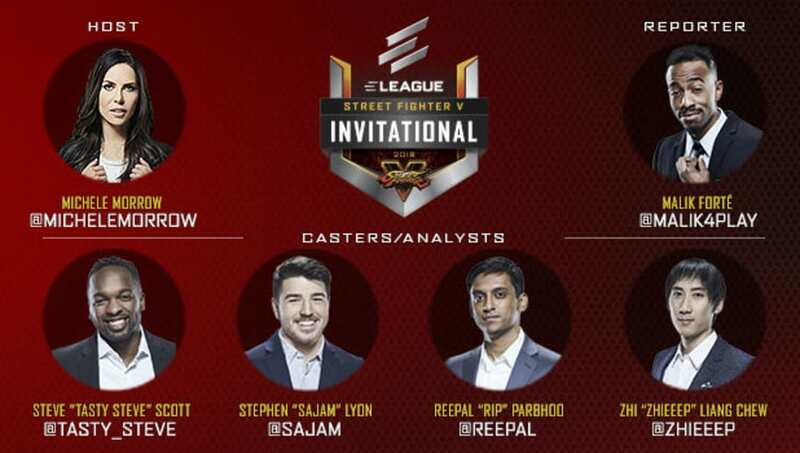 ​ELEAGUE revealed the talent lineup for the second ELEAGUE Street Fighter V Invitational on Thursday. The event will be headlined by a new host, Michele Morrow. This is the first ELEAGUE event since former host ​Richard Lewis left the company in April. ​Outside of Morrow, the other five talents return from the first invitational. Tasty Steve and Sajam were part of ​ELEAGUE The Challenger: Street Fighter V, an episodic reality show leading up to the event where a spot in the event was granted to the winner. Morrow is the co-host of EStream for Bleacher Report, co-anchor for DirecTV's BlizzCon Virtual Ticket show, and host of Super-Fan Builds. She also hosts a weekly gaming podcast called Status Effect. Forté is also a broadcast talent for the Overwatch League. TBS will a or a one hour invitational preview show for the ELEAGUE Street Fighter V Invitational on Friday, May 25, at 11 p.m. EST. The preview sure will reveal the four competition groups, catch up fans on what makes the FGC unique, and feature vignettes that focus on Jonathan "JB" Bautista, who earned his spot in the tournament by winning ELEAGUE's reality show, ELEAGUE The Challenger: Street Fighter V.